Get an 800 number to enable callers to reach you without paying for the call. When you get a 1800 number, you are providing potential customers with a free means of reaching your company. Without an 800 number, callers from outside your local calling area may hesitate to call you due to concerns about the cost of the call. Whether your business operates in the United States or elsewhere, you can use toll free numbers to reach a larger market. If you don't offer a customer a toll-free number, they may even choose not to call your business and call your competitor instead. For example, your company is located in Australia and you advertise in the UK. A country specific (UK) toll free number enables a caller to dial a familiar 0800 number in their country yet the call can be routed to Australia or any phone globally. By providing a 800 number, your company picks up the cost of the call - and callers will no longer hesitate to dial your number. Get a 1800 number, advertise it, and increase your sales as a result. Your company will appear more professional and callers will no longer hesitate to dial your number. Get a 1800 number, advertise it, and increase your sales as a result. Increasing sales is certainly a compelling reason to get a 1800 number. However, it's not the only one. In fact, many companies get a 1800 number to enhance their image. For example, if you operate a small design business out of your home and serve customers across the nation, a toll free number can make your company appear larger or more professional. Features that come with a 1800 number can further enhance your business image. For example, you could create a custom greeting, route callers to voice mail, route callers to specific extensions, activate "time of day" routing, and more. You can even change the destination "ring to" number as needed, ensuring that you never miss a toll free call no matter where you may be. 1800 numbers are "virtual" phone numbers in that calls are routed to whichever phone number you designate as your "ring to" number. This designated number can be located wherever you operate such as a call center in Florida, a main office in Michigan, or a home office in Oregon. You can even change the ring to number as needed. If your call center is in Europe but serves a U.S. clientele, you could get a 1800 number for your U.S. callers and then route those calls to your European call center. Ordering a 1800 numbers is easy and rates are more affordable than ever. The process involves selecting the type of toll free number you want, entering a ring to number (the number you want to ring when someone dials your toll-free number), viewing the plans and rates, and choosing the plan that's right for you. 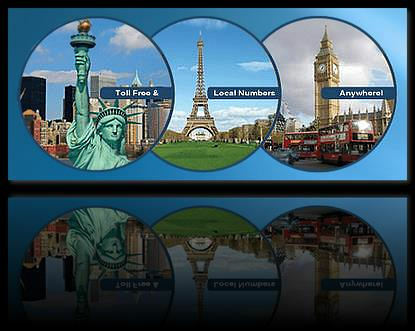 Toll-free numbers are available in many countries, not only the U.S. The list of countries is extensive. For example, do you need to advertise your product or service in Italy? We can provide you with an Italian toll-free number that will divert the calls instantly to your office in the US or 'any' country. Give your potential customers one more reason to call your company, get a 1800 number.